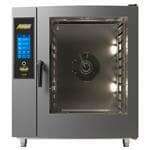 There are few pieces of kitchen equipment more versatile than commercial combi ovens. 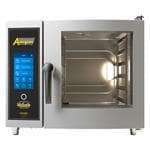 Designed to help you combine several different cooking units — which translates into a more productive, efficient commercial kitchen — the commercial combination oven can steam, bake, broil, roast and grill in a single unit. 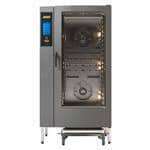 In fact, a well-designed commercial kitchen can eliminate many of their high-cost, high-maintenance cooking equipment in place of a commercial combi oven. Usually, combi ovens can replace a steamer and convection oven. Not only that, but these ovens are made for next-level efficiency and can replace your slow cookers, proofers and even holding units. They promise short cooking times and leave behind juicy, perfectly cooked meats, seafood and baked pastas. They’re also perfect for baking, frying, roasting and poaching, so they’re appropriate for many different foods. 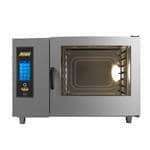 There are several different types of combi ovens. 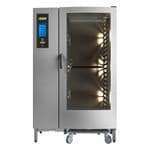 Commercial kitchens should consider exactly how much food they intend to cook in their combi ovens before making a decision. 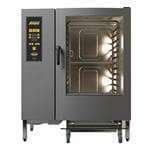 Like most kinds of commercial cooking equipment, combination ovens come in both gas and electric options. At a glance, electric combination ovens are more affordable to buy — they ring up for less up-front, but may cost more in utility bills over time — but are not as efficient as gas combi ovens. Gas also has the benefit of offering a faster warmup time and more temperature control. Where you install the unit and other limitations may play into which type is appropriate for your space. As you can tell, there are many unique aspects to consider when buying a combination oven. 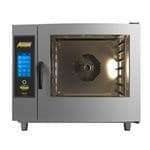 Once you’ve decided which one is best for you, be sure to buy from CKitchen.com to get a low-price guarantee and free shipping!